It all started one day when I was hungry for apple pie. I didn’t have store bought crust in the refrigerator and I didn’t feel like making the pie crust. 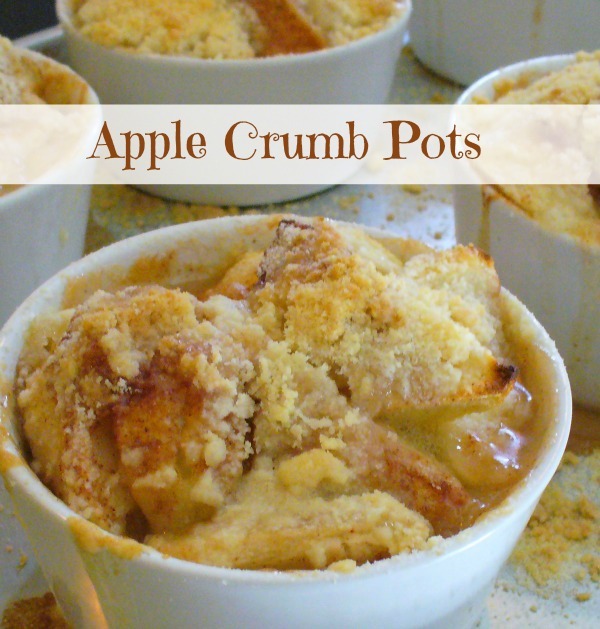 What is a girl to do...Apple Crumb Pots. 6-7 of your favorite baking apples, sliced. I love Ginger Gold for baking. The apple slicer is a well used gadget at our house. Cover the bottom of 6 ramekin cups with butter or non-stick spray. Place the ramekin cups on a baking sheet. Fill the cups with the sliced apples. In a medium sized bowl, combine ½ cup of sugar and 1 teaspoon of cinnamon. 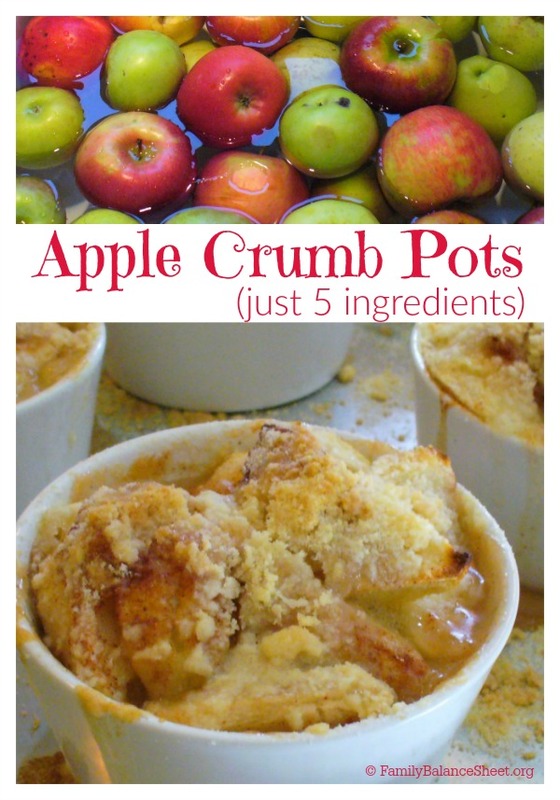 Sprinkle about ½ - 1 teaspoon of mixture per cup over the apples, depending on the type of apple that you like. You'll want more sugar for more tart apples and less sugar for very sweet apples. Keep the remaining of the cinnamon/sugar mixture to make the crumb topping. Take the balance of the sugar/cinnamon mixture and add more sugar until you measure ½ cup. Combine with ¾ cup flour and ⅓ cup butter. Use my clean hands or a spoon to mix together until crumbly. Bake at 400 degrees for about 40 minutes or until bubbly. At this point, your next major decision in life will be what to put on top of your Apple Crumb Pots: Homemade Whipped Cream or your favorite ice cream. 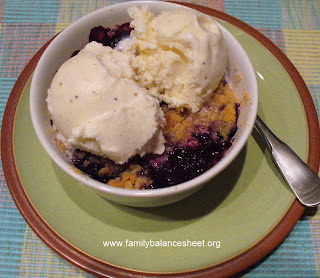 For our anniversary, I made my honey Blueberry and Peach Crumb Pots. We chose vanilla ice cream that night. These look soooo yummy! Thanks for sharing! Yum. Great solution and alternative to a pie crust. Excellent way to use up apples too! Thanks for linking up. I am going to share it over on Facebook today! I am going to make these this week! Looks great!